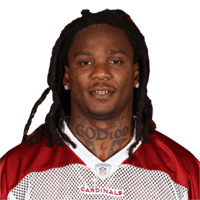 Published: Sept. 18, 2016 at 06:45 p.m.
Arizona Cardinals running back Chris Johnson rushes up the middle for a 3-yard TD. Published: Oct. 26, 2015 at 11:38 p.m.
Arizona Cardinals running back Chris Johnson breaks tackles and leaves a trail of Ravens defenders in his wake as he takes it 33 yards for a touchdown. Cardinals running back Chris Johnson was down... until he wasn't, dashing 62 yards down the field to help the Cardinals extend their lead in the third quarter against the Ravens. Published: Oct. 11, 2015 at 05:21 p.m.